Freezing cold, sugar free chocolate ice-cream is simply the king of all puddings when properly made. These mouth-watering recipes are delicious on their own or fantastic as an accompaniment to sugar free brownies or chocolate cake.As with fruit or vanilla ice-creams, remember to leave enough time to whip them up at least twice during the freezing process. This will ensure they are easy to scoop when you come to serve them. This is favourite with true chocoholics who enjoy the strong flavour of bitter chocolate and won’t miss that sugary sweetness. For a truly sugar free recipe use dark diabetic chocolate. For those who don’t mind a trace of sugar, a good quality, high content cocoa bar will work just as well. Sieve your cocoa into a large bowl and mix with your cream and sugar free strawberry jam, using a hand blender (or whiz all your ingredients in a food processor). Break your dark chocolate up into chips and stir carefully into your liquid ice-cream. Take a clean airtight container, with a fitted lid, and pour your mixture in. Place in the freezer for two to three hours or until half frozen. Remove and whiz up again. Repeat the process at least once more, preferably twice. A chocolate ice-cream with a minty essence, this makes a change from plain chocolate ice-cream. The peppermint essence beautifully complements the bitter cocoa flavour. . Beat your egg yolks and jam together in a large bowl. In a large saucepan heat your milk and cocoa powder. Stir until all the cocoa has dissolved. Pour into your egg and jam mixture, and mix well. Stir in your cream and peppermint essence. Take a clean airtight container, with a fitted lid, and pour your mixture in. Place in the freezer for two to three hours or until half frozen. Remove and whiz up again. Repeat the process at least once more, preferably twice. 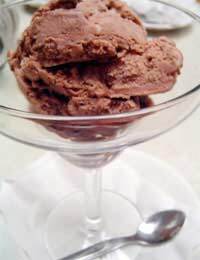 Definitely not a dish for the children, this sugar free chocolate ice-cream calls for a splash of whisky. The whisky gives it a good kick and makes this dessert the perfect way to round off a meal. Those who are happy to have a little sugar in their ice-cream could substitute the whisky and orange for a liqueur of their choosing. Sieve your cocoa into a large bowl and mix with your cream and sugar free strawberry jam, using a hand blender (or whiz all your ingredients in a food processor). Grate the zest of your oranges and squeeze the juice, stir into your liquid ice-cream, along with a splash of whisky Take a clean airtight container, with a fitted lid, and pour your mixture in. Place in the freezer for two to three hours or until half frozen. Remove and whiz up again. Repeat the process at least once more, preferably twice.